You know how a lot of avid home cooks and TV chefs say that chicken stock made from scratch is a thousand times better than anything you can buy in a can? The same holds true for granola bars—well, almost—homemade granola bars are superior to anything you can get out of a box. There are countless recipes for granola bars floating around on the Interwebs, and for good reason—there are a ton of opportunities for improvisation. I’ve never made them the same way twice. 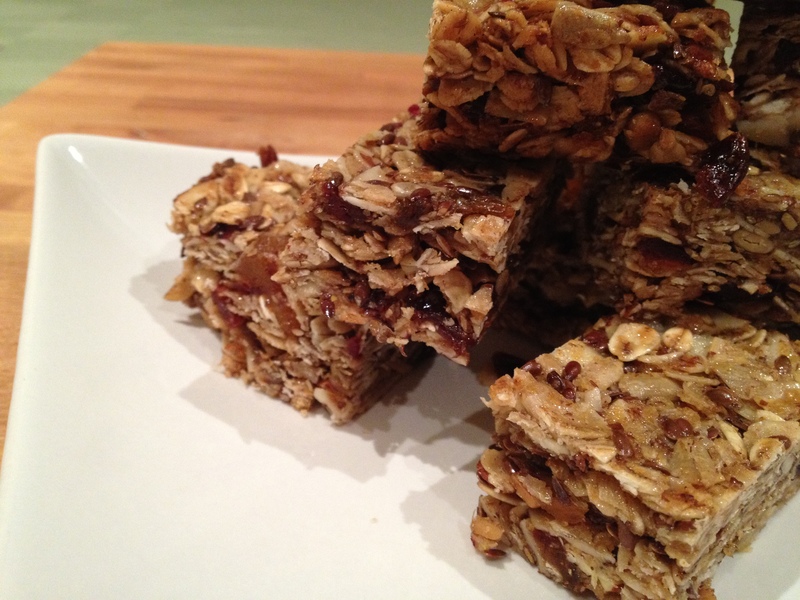 The base of the recipe is rolled oats, but beyond that you can use any combination of nuts, seeds or dried fruit. Shredded coconut is also a marvelous addition. And for a sweet treat, chopped chocolate works well too. As for the liquid ingredients—the glue keeping your granola bars together—you’ll need a fat (butter, olive oil or vegetable oil… coconut oil seems like a fine idea), a liquid sweetener (honey or agave syrup both work), a dry sweetener (brown sugar has more depth than white), and an extra burst of flavor (vanilla, almond, or other extract) plus a spice (cinnamon is ideal, and you can use a bit of orange or lemon zest if you like). These bars are dense, and make a fine blend of crunchy and chewy. You can also identify everything in the bars by looking at them, which you can’t do with most of the ones you can buy. And if you happen to bring a bunch of these to the office, people will ooh and ahh with amazement. “You made these?” Your co-workers will coo. “You must have spent all day on these,” they’ll insist. Except you didn’t. Maybe you spent a whole hour on them, tops. And then you went about your day while they cooled. 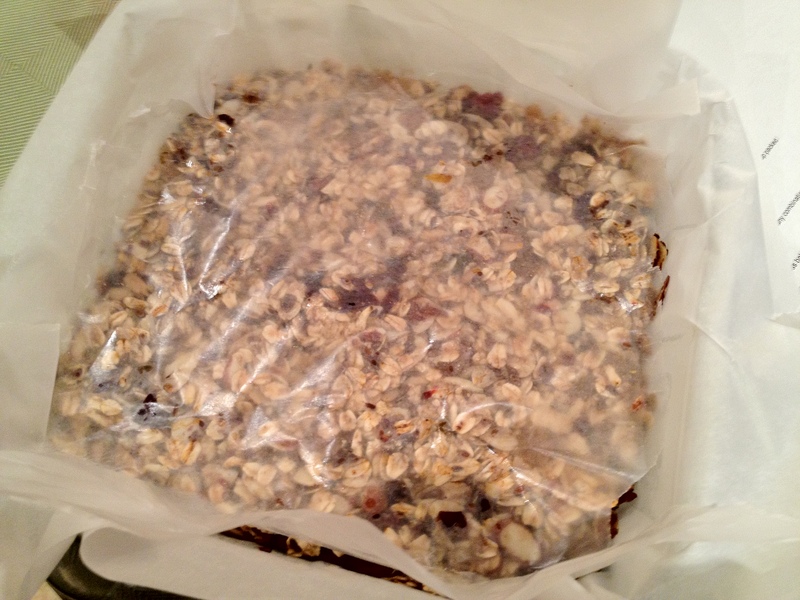 The only challenge with granola bars is being patient enough to let them cool to a good cutting temperature. 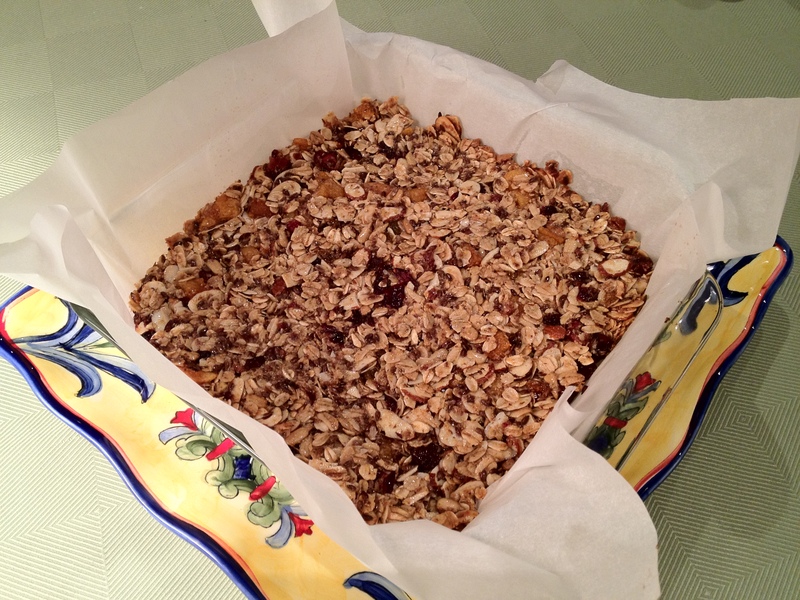 Don’t make them if you’re hungry—the granola mass needs about 6 to 8 hours to cool before cutting into bars. 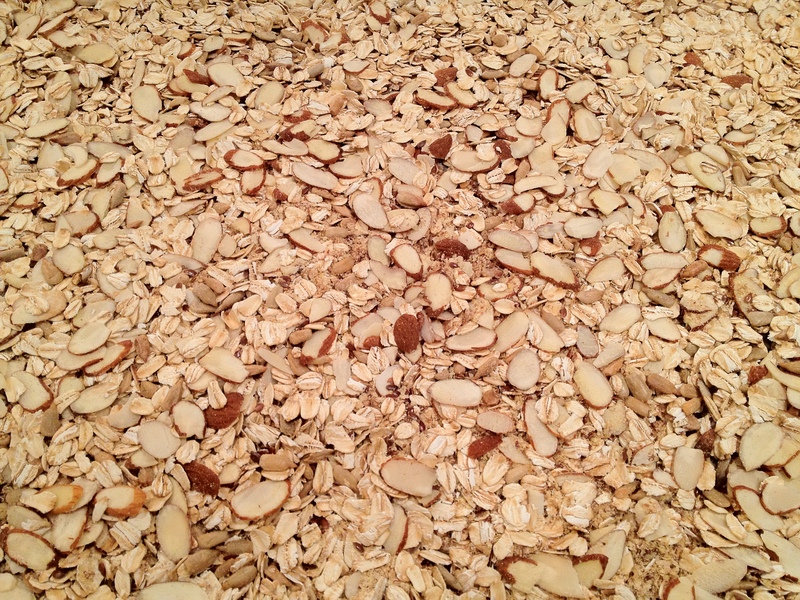 Try to cut too early, and you end up with a whole lot of granola. The recipe below will give an idea of the proportions, but as for the ingredients, use whatever you like or have on hand. 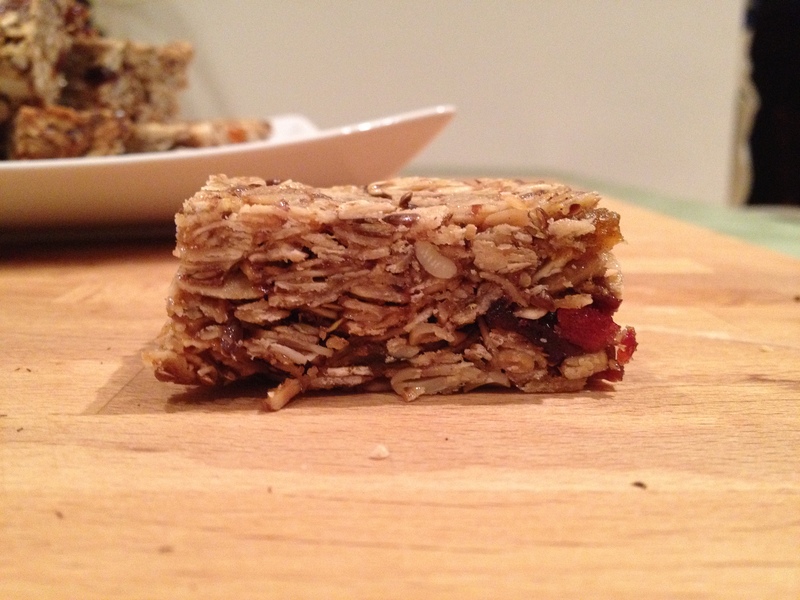 Either way, make your own granola bars once and store-bought bars will never compare. Preheat oven to 350 degrees. Butter the baking pan, and cover the inside with a piece of parchment paper, pressing down and folding as needed so it adheres to the pan. While the oat/nut mixture is in the oven, combine the honey, butter, brown sugar, vanilla extract, cinnamon and salt in a large saucepan and set over medium heat. 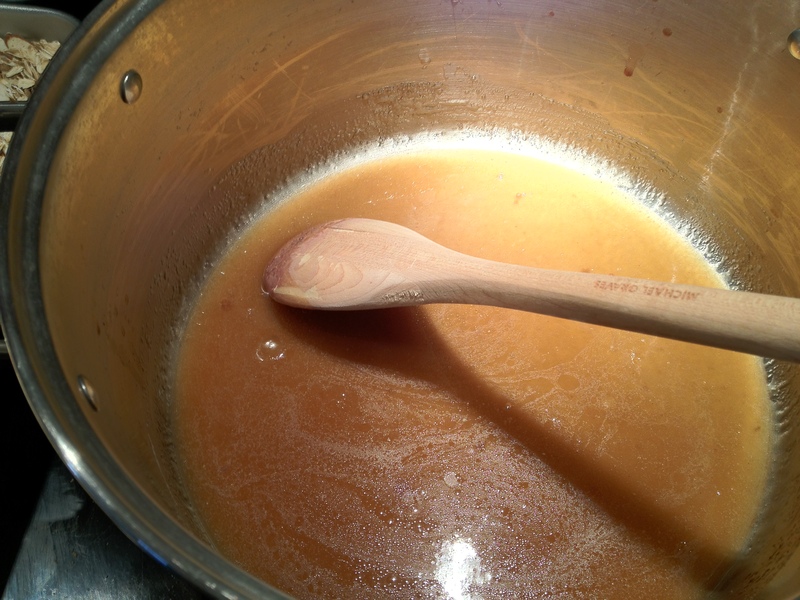 Cook until brown sugar fully dissolves, stirring frequently. Remove from heat. 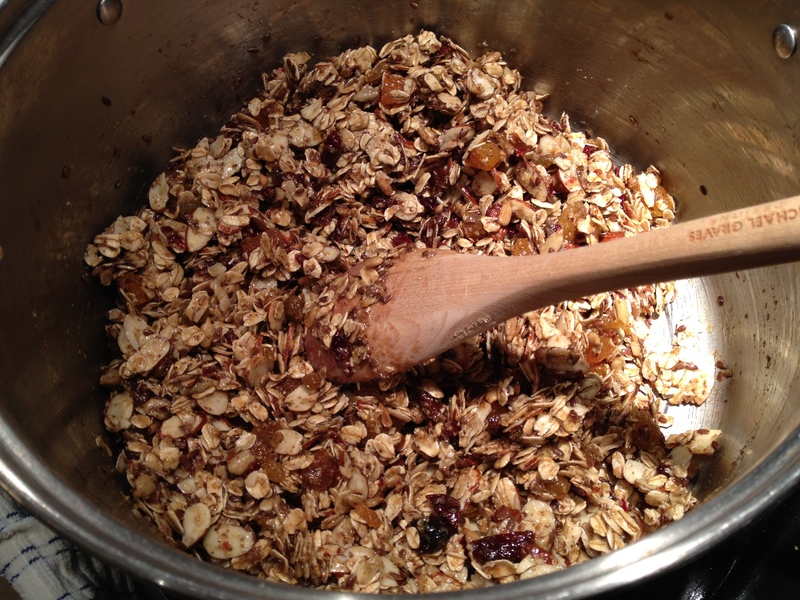 As soon as the oat/nut mixture is finished toasting, remove it from the oven and lower the temperature to 300 degrees. 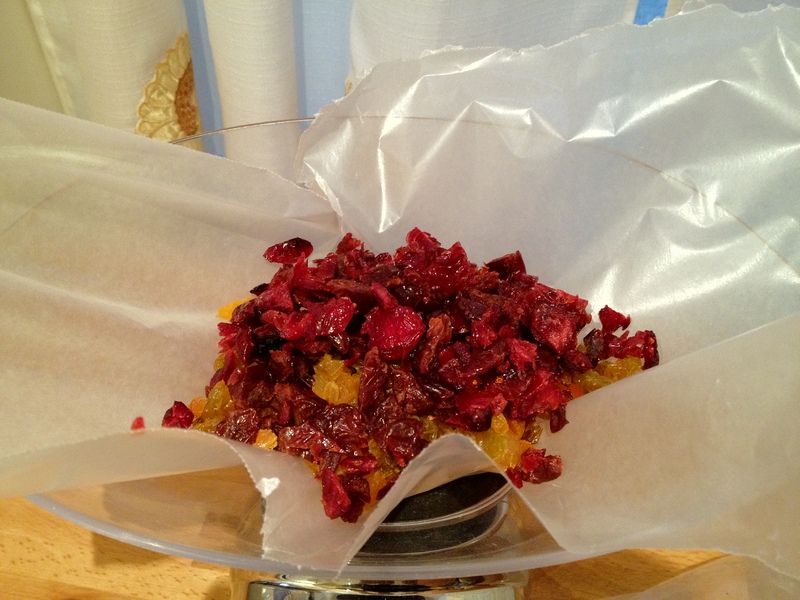 Add the mixture to the saucepan, along with the chopped dried fruit. Reduce the oven temperature to 300 degrees. Mix everything together with a wooden spoon until all the elements are combined. Place pan in oven and bake for 25 minutes. Remove from the oven and allow to cool completely. You cannot cut these warm; otherwise you’ll just end up with crumbled granola—which is also delicious, but if you’re looking for bars, have patience! If you’re making these in the evening, allow them to cool overnight before cutting. Otherwise, 6 hours of cooling time should do it. Alton’s recipe says to cut into 16 pieces, but I cut blocks instead of bars and stretched the number to 26 so I’d have more to share. These keep for a week in an airtight container at room temperature. If you want to keep them around longer, refrigerate for up to 3 weeks. 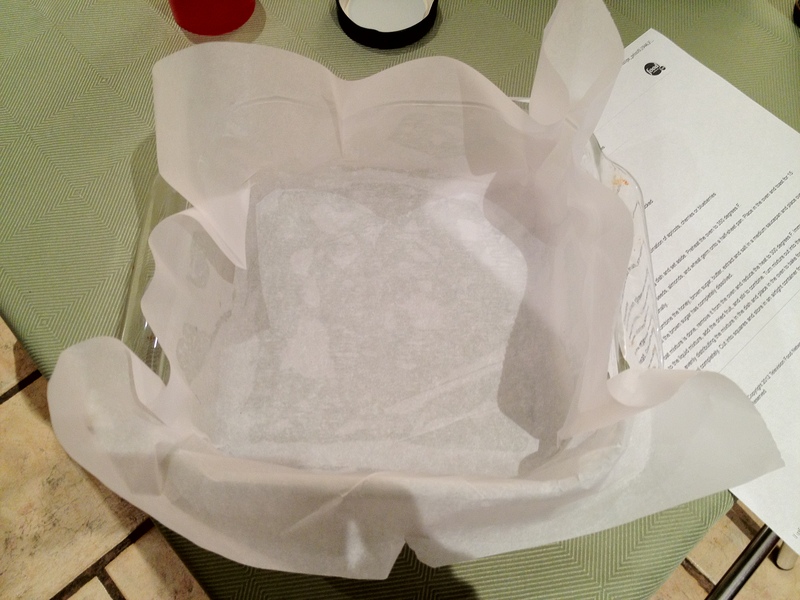 Put wax paper in between layers in the container if you have more than a single layer. 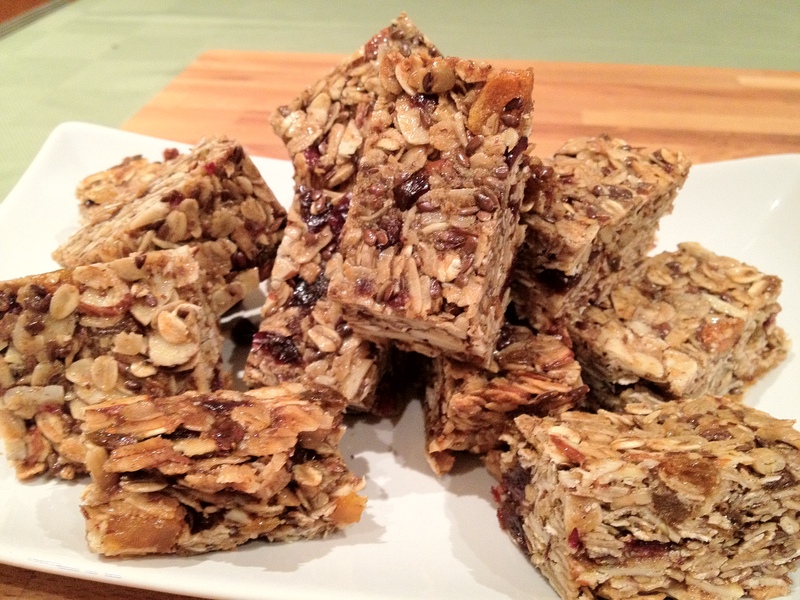 These granola bars are excellent on their own, or crumbled over yogurt. Berry sauce makes a lovely addition as well. With 26 servings, you’re looking at 3 points per bar. With 16 servings, it’s 5 points per bar. 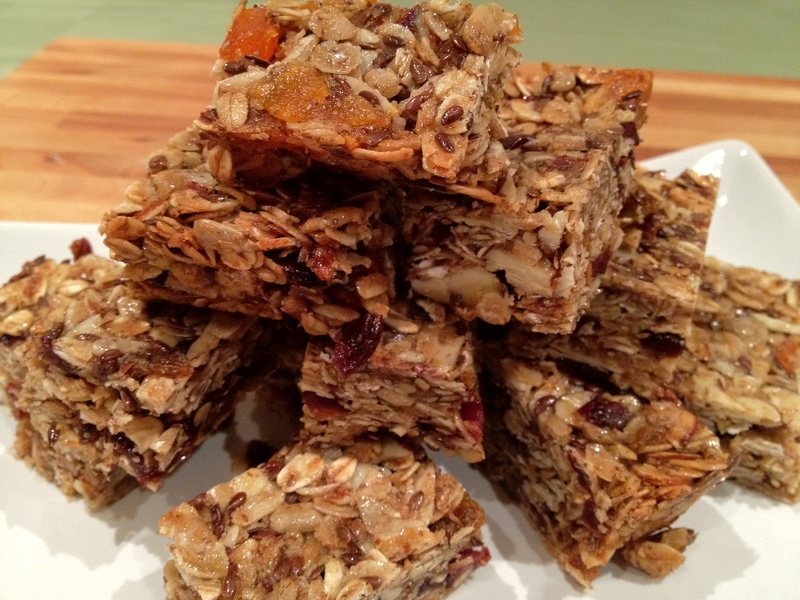 This entry was posted in Recipes and tagged alton brown, bars, chewy, crunchy, dried fruit, granola, healthy, nuts, oats, photos, points plus, seeds, snacks, weight watchers. Bookmark the permalink. Yes! I am going to try these as my next granola adventure.